As Google had gone for a campaign called “Google Internet Bus“, now Microsoft is on for something similar called Microsoft Bus Tour, which is going to be for 10 days, and its a North American road show starting at Montreal, and would end at New Orleans, at TechEd on June 7th, 2010. The tour is going to talk about Windows 7 and Office 2010. There are going to be 10 experts which includes senior Windows and Office team members, also includes top IT professionals. Join them for getting trained, learn about professional networking, and hands-on experience all from the senior and experienced professionals of Microsoft. 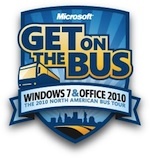 On this tour, Microsoft is going to give away a free Windows 7 ultimate packages, to a few attendees of the tour. The total number of copies going to be given away are 50, and its for the first 50 attendees of the tour at every stop. Its being given to the citizens of US or Canada, who are more than 18 years of age. Lucky were the ones who reached the places quite early. But that’s a great way of promotion of the Windows 7 OS, being one of the best versions of Windows.